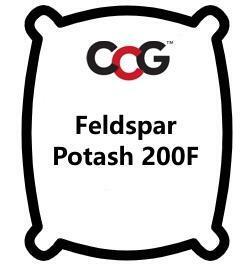 Feldspar Potash 200F (200 mesh) is also known as K-Feldspar, Orthoclase, K Feldspar, Potassium Feldspar. One of the most important materials for medium and high temperature ceramic glazes. A feldspar is typically referred to as 'potash' if there is significantly more potassium than sodium (typically there will be 2-5% Na2O). If the amounts are closer to equal they are termed potash-soda feldspars (or vice versa). Of course, real potash feldspars also have small amounts of CaO, MgO, Fe2O3, etc. Potassium feldspar melts at around 1200C (higher than soda feldspar) producing a more a viscous melt than does sodium feldspar. It can also produce a crystalline phase (leucite) that contributes to opacity. Thus, in industry, potash feldspars are often used more for matte glazes while soda feldspar is used for glossy glazes.